I hope to do a few of these with some useful tips and tricks in helping anyone along in the Vanilla Minecraft map, Skyblocks. The map can be found here. While technically not a mod, the map is a drastic departure from the basic mechanics of Minecraft and to my mind introduces game play that is so radically different that is deserves status as a ‘Mod’. When you start this map you are greeted with this. In the chest is some lava and ice which you can use to create infinite cobblestone (Which you still have to mine manually. This isn’t redpower). From there you simply build. 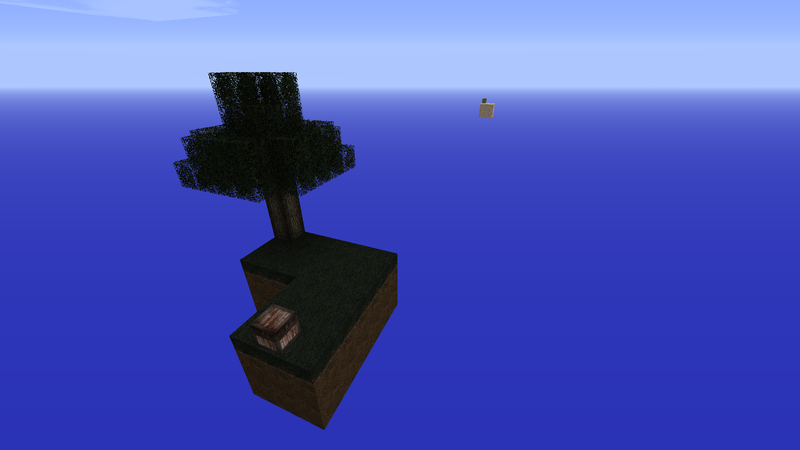 In the distance is a precarious sand island with some obsidian and seeds. The sand has a tendency to fall if another block touches it (at least in my experience) so I had to build a platform beneath it before plundering it’s goodies.